US firm Studio Gang has unveiled plans for a glass tower that is "sculpted by the angles of the sun", adjacent to the High Line in New York's Meatpacking district. 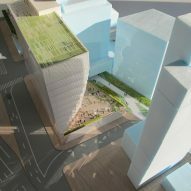 The office building at 40 Tenth Avenue will sit between the popular elevated park and the Hudson River, close to the Standard Hotel. The location is also near to BIG's twisting towers that are currently under construction and opposite the site for Thomas Heatherwick's Pier 55 park. The building's shape was informed by the path of the sun over the site, with sections removed from the cuboid form to prevent blocking light and views. The result is a "gem-like facade", created by faceted glass panels across the angled sections of external wall. 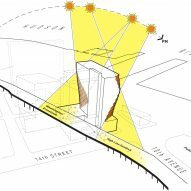 "Sculpted by the angles of the sun, the Solar Carve Tower explores how shaping a building in response to solar access and other site-specific criteria can expand its architectural potential," said Studio Gang, which is based in Chicago and led by architect Jeanne Gang. 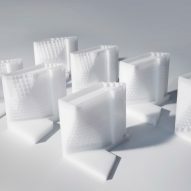 This approach – dubbed "solar carving" – was developed as part of the firm's tall building research. The Solar Carve Tower will include 166,750 square feet (15,492 square metres) of floorspace. An outdoor area will extend from the High Line up to the entrance and benefit from maximum sun exposure thanks to the building's form. 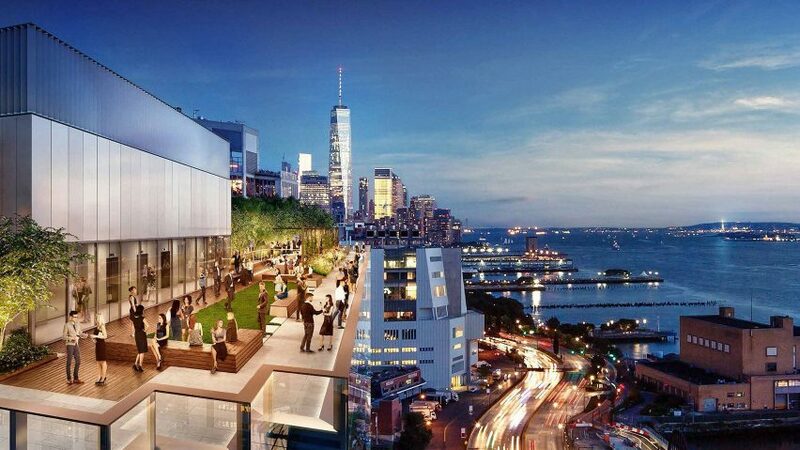 More private external space will be provided on the roof, from which occupants will enjoy views of Downtown Manhattan. The transformation of the High Line from a disused elevated railway to a public park, by Diller Scofidio + Renfro and James Corner Field Operations in 2009, has spurred a boom of development along its length. Projects by Zaha Hadid Architects and Renzo Piano are among those to have sprung up in the vicinity, with the massive Hudson Yards development also located at the top end. Studio Gang's other projects in New York include an extension to the American Museum of Natural History and a fire station in Brooklyn. The firm has also revealed plans for a tiered tower in St Louis and is working on a supertall skyscraper for Chicago.